SECONDMAY provides Extra Soft 100% genuine leather cushion in classic style with extra comfortable. Quality with comfort is the apt phrase for this handmade patchwork pattern pillow.Throw it on your sofa or sleep with it on your bed, its amazing look and comfort will never cease to amaze you. 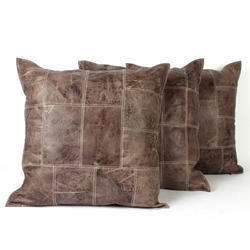 This brown and mocha colour 100% Imported hairon leather and cotton velvet pillow suits any style of your home décor. 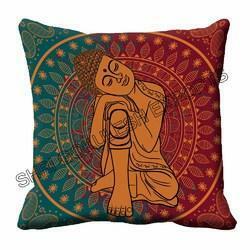 Leather cushion covers The spectrum of leather home furnishings comprises of leather cushion covers. The range can be availed in numerous colors and designs, as per customers requirements. Our wide range of cushions is an effortless way to give furniture new color & look. To add a hint of subtleness and serenity to the interiors of your home, get this beautiful leather cushion covers from the house of JUSTANNED.